I know you should write about things you know. But today I’m writing about something I just can’t seem to get my head around; American Foreign Policy. This has been eating at me since the turmoil (revolution) began in Egypt. At first I was going to use some quotes from the current administration regarding the Egyptian revolution. But I’ve decided against it. I don’t want you to think I’m just bashing President Obama. This goes back farther than 2 years. In truth, I don’t understand why we continue to do the same thing over and over expecting different results. 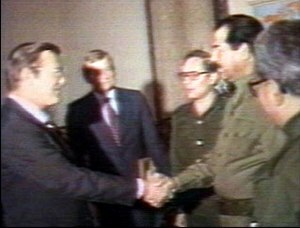 We supported the Shah, now we are at odds with Iran. We supported Saddam Hussein: then helped get rid of him. We have supported Mubarak for almost 30 years and now we find ourselves in a pickle. If we admit he was a dictator then we have to answer the question, “Why did America support a dictator?”. If we support the revolution, we have to answer the question, “What happened to your loyalty to Mubarak?” It seems like a no win situation for us because our foreign policy, especially in the middle east, MAKES NO SENSE. Question: Does Islam hate America because of her freedom or because she preaches freedom and self-governance but her actions have undermined those same values for decades in their countries? I don’t have any answers here. I’m just asking questions. But I think the answer is in here somewhere. Question: What happens when the Saudi’s decide their done with the Saudi Royal Family? What side will we be on? One last question: If you lived in a Muslim country, would you view America’s foreign policy as consistent or schizophrenic? Foreign relations are mutable. We fought Great Britain for our freedom, with assistance from France and what would later become the Germany of WWI and II. Russia was our ally until WWII ended. Reagan helped create the Taliban to fight against the USSR. Who knows what tomorrow’s world will look like? Every country wants freedom, most Islamic states dislike Israel, besides that an oil dependence, everything else is up for grabs. Your comment points out my conundrum. People are mutable, principals are not. Do we stand on the principals of our founding or are we simply trying to be on the side of the “winners” of various conflicts? If we abandon principals and simply try to pick the winners and losers around the world, should we be surprised that we are viewed as inconsistent and unreliable allies?